The following statement is being issued by Branstetter, Stranch & Jennings, PLLC regarding In re Prograf Antitrust Litigation. 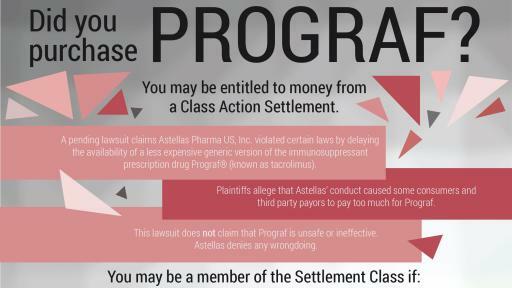 A lawsuit is currently pending claiming that Astellas Pharma US, Inc. (“Astellas” or “Defendant”) violated state antitrust, unfair competition, consumer protection, and unjust enrichment laws of certain states by delaying the availability of a less expensive generic version of the immunosuppressant prescription drug Prograf® (known as tacrolimus). Plaintiffs allege that Defendant’s conduct caused some consumers and third party payors to pay too much for Prograf in certain states from September 3, 2008 to December 31, 2010 (also referred to as the “Class Damage Period”). This lawsuit does not claim that Prograf is unsafe or ineffective. Astellas denies any wrongdoing. ARE YOU AFFECTED? 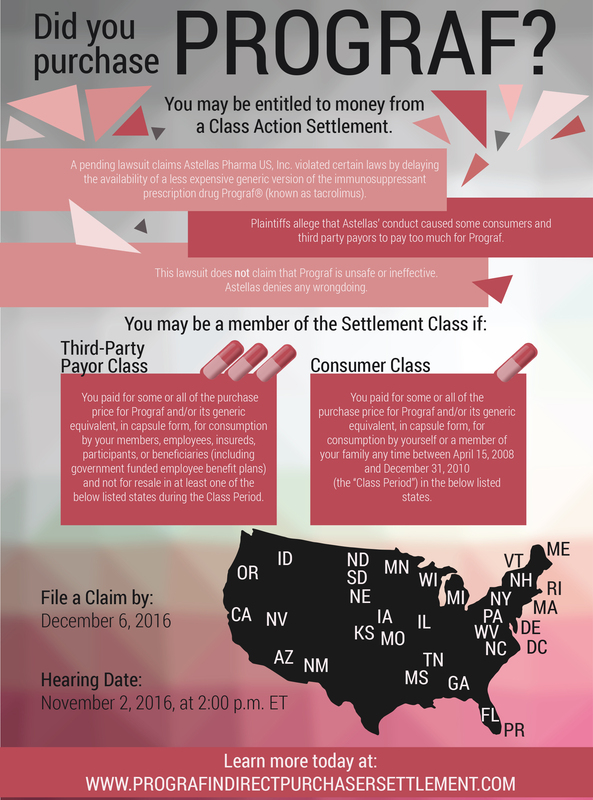 As a Consumer, you may be a member of the Settlement Class if you paid for some or all of the purchase price for Prograf and/or its generic equivalent, in capsule form, for consumption by yourself or a member of your family any time between April 15, 2008 and December 31, 2010 (the “Class Period”) in Arizona, California, Delaware, District of Columbia, Florida, Georgia, Idaho, Illinois, Iowa, Kansas, Maine, Massachusetts, Michigan, Minnesota, Mississippi, Missouri, Nebraska, Nevada, New Hampshire, New Mexico, New York, North Carolina, North Dakota, Oregon, Pennsylvania, Puerto Rico, Rhode Island, South Dakota, Tennessee, Vermont, West Virginia, or Wisconsin. As a Third-Party Payor, you may be a member of the Settlement Class if you paid for some or all of the purchase price for Prograf and/or its generic equivalent, in capsule form, for consumption by your members, employees, insureds, participants, or beneficiaries (including government-funded employee benefit plans) and not for resale in at least one of the above-listed states during the Class Period. WHAT ARE YOUR RIGHTS AND OPTIONS? Stay in the class and file and claim: To share in the distribution of the Net Settlement Fund, you must file a claim form on or before December 6, 2016. 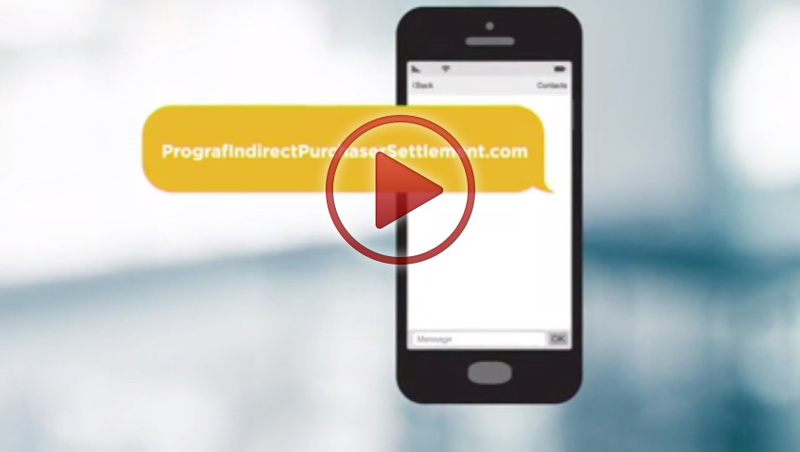 Claim forms may be requested online at www.PrografIndirectPurchaserSettlement.com or by writing to Prograf Indirect Purchaser Settlement c/o GCG, P.O. Box 10112, Dublin, OH 43017-3112. Do Nothing: If you do nothing, you are choosing to stay in the Settlement Class and will be bound by the Settlement Agreement and future Court rulings. Joe P. Leniski, Jr. Douglas Plymale, Ph.D.
A hearing will be held on November 2, 2016, at 2:00 p.m. Eastern Time, before the Honorable Rya W. Zobel in Courtroom 12 of the United States District Court for the District of Massachusetts, United States Courthouse, 1 Courthouse Way, Boston, MA 02210 to determine, among other things, whether the proposed settlement should be approved by the Court as fair, reasonable and adequate. WANT MORE INFORMATION? This notice is only a summary. More information can be found at www.PrografIndirectPurchaserSettlement.com, by calling 1-844-322-8238, writing to Prograf Indirect Purchaser Settlement, c/o GCG, P.O. Box 10112, Dublin, OH 43017-3112 or by email at Questions@PrografIndirectPurchaserSettlement.com.